Stop! Hang out for a second! Before you click away thinking that this powerful little app is too specialized for a typical Windows user, consider this: ActMask Document Converter allows you to convert ANY PRINTABLE DOCUMENT to professional-quality PDF, TXT, Multi-page TIFF, JPG, GIF, BMP, PNG, TGA, PCX, EMF or SPL (Print Spooling File). That means ANY PRINTABLE DOCUMENT! Powerpoint presentations, HTML websites, Excel documents, Word documents, Illustrator files, blog entries, CSV files... it doesn't matter. As long as you can print it, ActMask Document Converter can convert it with just a couple of clicks. Imagine -- No more shuffling back and forth between image processing, graphic design, word processing, and PDF apps trying to find the right conversion path! But there's more. 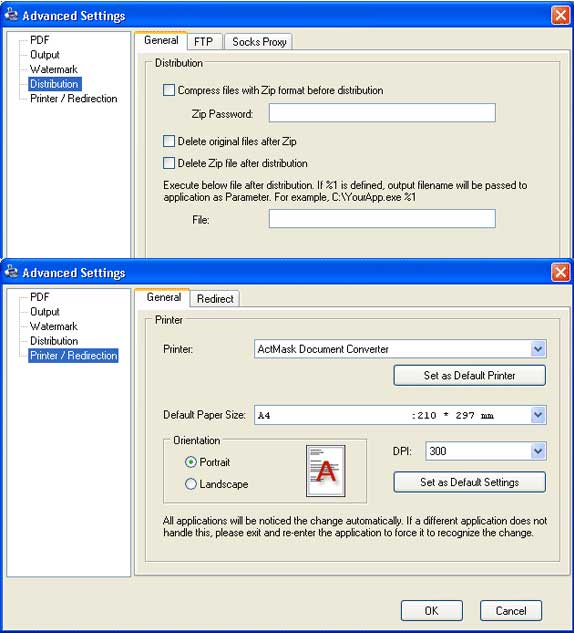 ActMask Document Converter also provides comprehensive PDF optimization, auto-export features, embedded watermarks, FTP distribution utilities, and even WinZip compatible compression schemes. These days, with the multitudes of document formats out there, we simply can't live without ActMask Document Converter. Give it a try, we're betting that after a few minutes you won't be able to either. 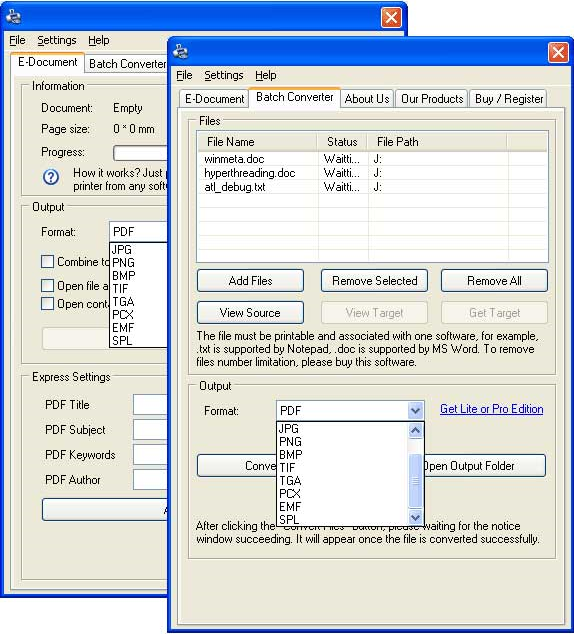 PDF Conversion: Convert any printable document to a professional-quality, searchable PDF from any Windows application. 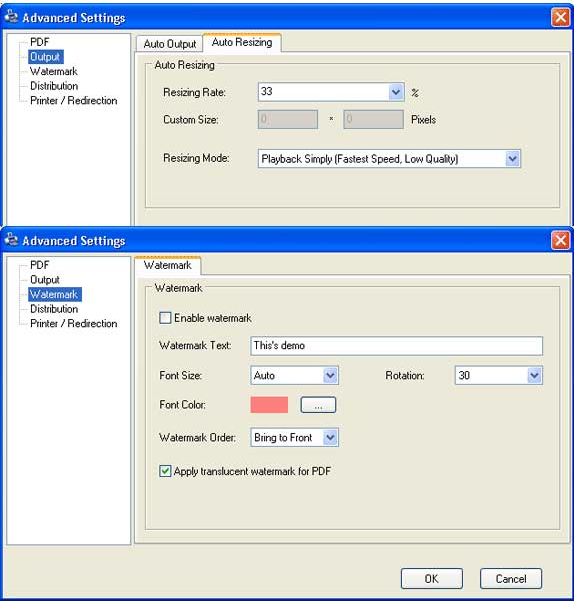 Complete control of PDF output: Supports advanced PDF features like document descriptions, font embedding, compression options, optimization options, and more. 128 Bit Encryption: Set strict security or restriction options for any PDF. Merge Multiple Documents into one Single PDF: Merge multiple document or image files into a single PDF file. Text and Image Conversion: Convert any printable document to TXT, Multi-page TIFF, JPG / JPEG, GIF, BMP, PNG, TGA or PCX format. Batch Conversion: Bulk convert documents to PDF, TXT, JPG, GIF, TIFF, BMP, PNG, TGA or PCX with a single click. Supports playback, nearest, and bilinear resizing functions. Create online presentations and e-Learning courses in PowerPoint! Easily Extract and Process Your Outlook Messages!